Wantagh, New York, USA. July 4, 2016. 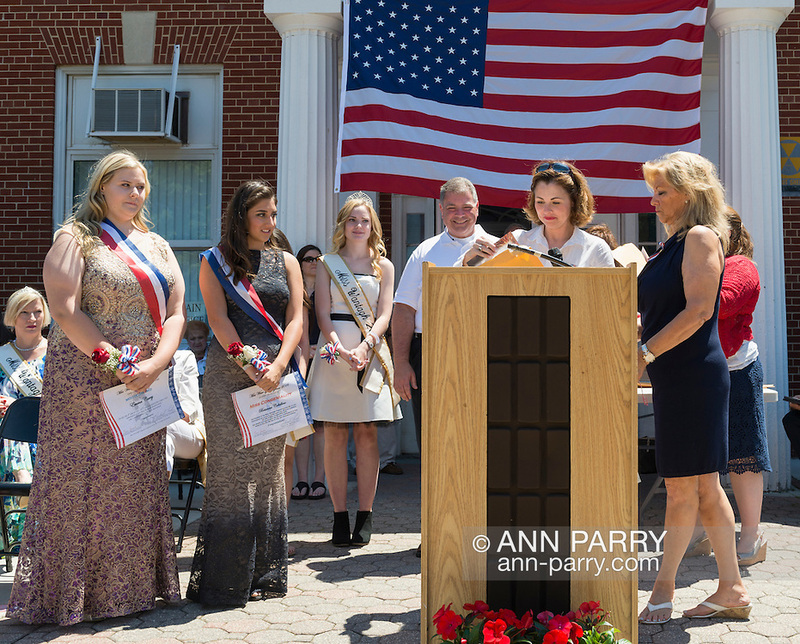 Standing L-R, EMMA CAREY; BRIANNA COLTELLINO; KERI BALNIS, Miss Wantagh 2015; STEVE RHOADS, Nassau County Legislator District 19; ERIN KING-SWEENEY, Town Councilwoman; and ELLA STEVENS, Miss Wantagh Pageant coordinator; at the 60th Annual Miss Wantagh Pageant, an Independence Day tradition on Long Island. O'Connell is opening envelope to find who Miss Wantagh 2016 is - Emma or Brianna. Since 1956, the Miss Wantagh Pageant, which is not a beauty pageant, crowns an area high school student based mainly on academic excellence and community service.